Interested in bringing something like the Sci-I Project to your area? What is a great way to increase students interest in science? Support them in doing the authentic science with real world data! 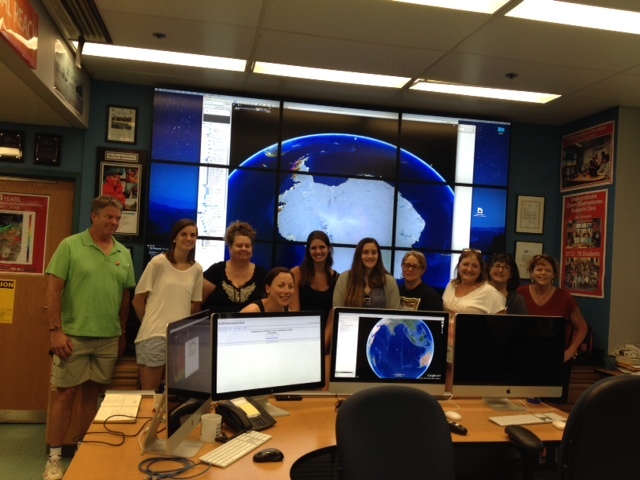 Some of the Polar-ICE Sci-I Project 2016 participating teachers (left to right): Tom Grych, Jennifer Smolyn, Dolores Taylor, Carolyn Laymon, Kimberly Kellam, Kelly Terry, Denise Hardoy, Sue Morrow, Stacia Lothian; and Dr. Bridgette Clarkston (co-facilitator, California State University, Monterey Bay) touring the RU COOL lab. The Polar ICE Science Investigations (Sci-I) Project (2015-18) was designed to increase educator and student skills in designing and conducting open-ended science investigations as well as analyzing and interpreting online data in alignment with Next Generation Science Standards (NGSS) through the lens of polar science. The Sci-I Project focused on grades 6-9 from throughout the United States. Preference for participation in the project was given to educators that work in school districts that serve predominately underserved and underrepresented communities. A culminating Student Polar Research Symposium with the top student teams presenting their findings to polar and university scientists. 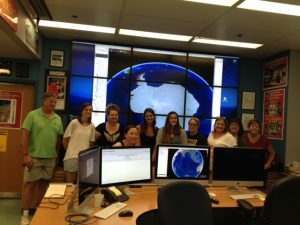 Participating educators explored polar science, real world data, and the process of developing an open-ended science investigation during the summer workshop. Educators interacted with polar scientists and engaged in open-ended science investigations to learn themselves and to explore how to effectively lead students in designing, developing, and conducting polar science investigations. During the year, students conducted their own open-ended, student-developed investigations using authentic, real world, online polar data. Students were empowered to develop questions and an inquiry-based scientific investigation that built upon their knowledge of the process of science. Students developed scientific posters to communicate their results. Towards the end of each year, participating students presented their results and findings to polar scientists and to one another at the Student Polar Research Symposium as a culminating event. The Symposium excited and engaged students about the polar regions and science by enabling students to act as science communicators and peer educators.